Food for the Poor handing over a quantity of relief supplies to a representative of the Amerindian People’s Association (APA). Guyana’s Civil Defence Commission (CDC) said emergency supplies are being dispatched to six flood-stricken villages in Region 8 (Potaro-Siparuni) and the Public Health Ministry would be moving to curb an outbreak of diarrhea in one of the communities, government announced. “A total of three flights with supplies were dispatched today to Chenapau and Orinduik. The CDC is establishing a Forward Operations Centre at Orinduik, from where relief supplies and flood kits will be transported by boat to the affected villages which are inaccessible by air. An additional four flights with food and relief supplies will be dispatched to Chenapau and Orinduik tomorrow, Saturday May 20, according to a statement issued through the Prime Minister’s office. 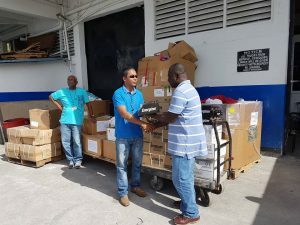 The Amerindian People’s Association (APA) earlier Friday received several items to be dispatched to affected residents. Water, bleach, biscuits, rice, flour, sugar, salt, powdered milk, cooking oil, margarine, toilet paper, matches, canned foods, potatoes, tea bags, soap and soap powder. The affected villages were listed as Kaibarupai, Waipa, Chenapau, Sand Hills Settlement, Itabac and Kanapang. The flood has been caused by excessive rainfall in the south and southwestern parts of the region in recent days. In addition, the Ireng River has over-topped its banks in some areas north of Orinduik. The CDC says it has conducted an aerial reconnaissance of the affected areas. “There have been no reported deaths, missing persons or serious injuries. However, the Ministry of Public Health has received reports of some cases of diarrhea in the village of Chenapau. Chenapau – Entire village flooded. Fifteen houses under water. Population – 620 persons. Reports from the region are that the village of Kaibarupai has not suffered flooding previously while the level of flooding in other villages far exceeds previous situations of minor flooding. The villages are located mainly in valley areas where the water from the excessive rainfall pooled and resulted in the excessive flooding. Villagers have relocated to higher ground in close proximity to the various villages. Minister of State Hon. Joseph Harmon Friday convened an emergency meeting at the Ministry of the Presidency with Minister of Communities Ronald Bulkan, Minister within the Ministry of Public Health Dr. Karen Cummings, Director General of the CDC Col. Chabillal Ramsarup, Region 8 Regional Chairman Mr. Bonventure Fredericks and other agencies to coordinate the government’s response which is being led by the CDC.